"This is a richly textured, compelling story, veined with sharp and striking insights. Pulled By the Heart invites the reader to bear witness to a story of courage, the struggle to follow the demands of the heart, and the hard-earned wisdom of distant roads." "This poignant love story of two cultures travels to areas of war and sometimes places of opulence. Nancy Wall lived the romance that carried both fantasy and fright. Here she brings to words the exotic glamour of the Middle East. From Wisconsin to Beirut and beyond this blue-eyed blonde transferred her strength and independence to a world that could demand submission. With a powerful will and aid from others, including a child of five, she chooses freedom over fear." "Everybody's got a background. Every life has a complex warp of events, people, places, and dramas through which a person's individual history travels, forming the fabric of a biography. Of course, to each of us, these salient points loom large; the absent parent or the death of a loved one can echo in our personality and life choices for decades. The unfortunate fact for most autobiographies is that these things are rarely as interesting to other people. Why? We all face our own dramas: perhaps the static of our own life-experiences is so loud that it drowns out the tunes of others, no matter how much we might find them interesting. Perhaps it's just our natural first-person bias -- the story or incident that has been so formative for us, by which everything we do makes sense, simply might not mean as much to someone with a different context. The geography of all of our individual experiences is so pervasively rugged that, from a distance it takes a really extraordinary view to actually catch the eye. "Ms. Wall's Pulled by the Heart does indeed catch the eye. Her autobiographical story of a Wisconsin girl who marries into a Lebanese Syrian family is the first book from a woman whose tale reads like a travelogue of an Arab world just coming to grips with the West in the post-colonial 1970's. From her first arrival in Lebanon, she recounts nuances of Arab life from the point of view of an intelligent but (in the beginning) somewhat sheltered American. "It is, I think, a story that speaks most deeply to married women. What would be an otherwise relatively universal experience -- to 'fit in' and to try to make a happy life for her husband and children -- explodes into epic technicolor with her tense descriptions of ducking sniper fire in their home in Beiruit or the lonely helplessness of an Abu Dhabi jail cell. "I confess, I'm not generally fond of autobiographies. Many are ultimately little more than an exercise in projected conceit: "I'm so important, my life MUST be interesting." And so usually untrue. Ms. Wall has an entirely different agenda, and one that provides her tale a poignant currency today. The story of a midwestern girl swept off her feet by a handsome dark-eyed foreigner is practically cliché; her effort to understand and adapt to her adoptive culture is not. In our post-9/11 world, the gulf of understanding between the Occident and Orient looms larger than ever before. The pundits and politicians with their Manichean oversimplifications seem incapable or unwilling to spend the effort trying to bridge a gap that none of us want, that we all recognize is dangerous, and seems to be growing. Nancy Wall's story puts the lie to its impassability (and inevitability). For all that her story unhesitatingly describes, the challenges she faced as a woman in an Arab world, her love for the people and the culture suffuses every chapter. Her compassion and effort to understand an alien culture provide a creditable example; no less is her unwillingness to compromise her fundamental rights when things eventually go badly. Writ large, I daresay it could even reasonably inform U.S. foreign policy. 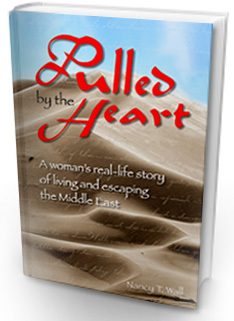 "Pulled by the Heart's subtitle is '...escaping the Middle East.' While Ms. Wall and her children dramatically left the Middle East, to be sure, it's equally clear that she had truly made that her home. It remains part of her. So she did in fact "escape" a marriage and situation that had gone very wrong, but she admits that nevertheless the peoples and culture of the Middle East will always … pull at her heart. "I look forward to Ms. Wall's next work, hopefully a conclusion to her subsequent years in the U.S. which hint at even more interesting drama." "Though my mother language is Italian, I was able to read "Pulled by the Heart" in half a day because it is written in an uncomplicated simple way. The story is truly fascinating. I admit that the author wrote beautiful things about Italy, so my Italian ego prevails! Nancy’s story is incredible, and it is astonishing how she managed all the situations thrown her way. She managed it with the power of love. In each and every page you read, and even in the darkest days, you can feel that she confronts her situation with love. You cannot find a single word that is begrudging. It is not only a great story – it is a lesson for each of us how with love you can restart a life." "I read your book with great anticipation and forethought. Then, realizing I knew your story too well, I waited a few days and re-read it - just yesterday. I’m glad I did. Little things that bothered me at first didn’t bother me anymore. In fact, I realized their purpose. It was a difficult story and you did a superb job. In some way, though, I wish I could have written my own little epilogue to your story. Remember, it was my divorce that brought you home to Wisconsin that Christmas. You did it for me and I promised to come to the Middle East for you. I don’t think anyone else quite understood your world as well as I did. And fortunately I got to witness it as well. Somehow in your book I wanted the world to know how you moved in that culture. Quite often you "smiled shyly" in your book. I understand that had its place, but it’s far from what I witnessed. You were a Bird of Paradise over there. You were incredibly fluent in the language and the Arabs loved you all the more for it. But they also loved your flair. You were intoxicating. They saw you coming in the souks. How they loved to barter with you. I would want something and you would work it. I also saw the disappointment when others just purchased in the souks – no bartering. But you would speak your Arabic with great gestures and barter for a half hour. Everyone wanted the two blond ladies to come to their stall. I will never forget how you worked the souks. And the woman who did your hair – not just your blond hair, Nancy, she was equally drawn to your vivacious personality. The sheik’s wife could have blown in with her entourage – but you didn’t need an entourage. You were brilliant. You moved as if born to this exotic life. It remains the most amazing trip of my life for so many reasons – but my strongest memories are of you embracing the culture and the culture embracing you. You should have been an ambassador. Well done. Bravo!"